As the summer weather creeps in I have a recipe for a smoothie that I think everyone can enjoy! It’s refreshing, but not for those who are afraid of a little spice! It includes cantaloupe, honey, milk, yogurt, and cardamom. I’m sure most readers of my blog are familiar with heyl (cardomom), for those of you who aren’t it’s a seed that most Arabs, East and North Africans, and South Asians use with tea or coffee and sometimes dessert! For this smoothie depending on your taste you can grind the cardamom seeds for more impact or just drop in the seeds. Mind you, might get seeds in your drink that way. For someone who has never had cardamom seeds it might be a bit overwhelming. Blend cantaloupe, cardamom, honey, milk, and yogurt for about 3 minutes and voila you have a tasty treat! Be sure to take seeds out of the cantaloupe when cut into. And you can save whatever you don’t use in your fridge. Of the estimated 7,000 languages spoken in the world today, linguists say, nearly half are in danger of extinction and likely to disappear in this century. In fact, one falls out of use about every two weeks. The study was based on field research and data analysis supported by the National Geographic Society and the Living Tongues Institute for Endangered Languages. The findings are described in the October issue of National Geographic and at languagehotspots.org. Beginning what is expected to be a long-term project to identify and record endangered languages, Dr. Harrison has traveled to many parts of the world with Gregory D. S. Anderson, director of the Living Tongues Institute, in Salem, Ore., and Chris Rainier, a filmmaker with the National Geographic Society. The researchers, focusing on distinct oral languages, not dialects, interviewed and made recordings of the few remaining speakers of a language and collected basic word lists. The individual projects, some lasting three to four years, involve hundreds of hours of recording speech, developing grammars and preparing children’s readers in the obscure language. The research has concentrated on preserving entire language families. In Australia, where nearly all the 231 spoken tongues are endangered, the researchers came upon three known speakers of Magati Ke in the Northern Territory, and three Yawuru speakers in Western Australia. In July, Dr. Anderson said, they met the sole speaker of Amurdag, a language in the Northern Territory that had been declared extinct. “This is probably one language that cannot be brought back, but at least we made a record of it,” Dr. Anderson said, noting that the Aborigine who spoke it strained to recall words he had heard from his father, now dead. Many of the 113 languages in the region from the Andes Mountains into the Amazon basin are poorly known and are giving way to Spanish or Portuguese, or in a few cases, a more dominant indigenous language. In this area, for example, a group known as the Kallawaya use Spanish or Quechua in daily life, but also have a secret tongue mainly for preserving knowledge of medicinal plants, some previously unknown to science. “How and why this language has survived for more than 400 years, while being spoken by very few, is a mystery,” Dr. Harrison said in a news release. The dominance of English threatens the survival of the 54 indigenous languages in the Northwest Pacific plateau, a region including British Columbia, Washington and Oregon. Only one person remains who knows Siletz Dee-ni, the last of many languages once spoken on a reservation in Oregon. In eastern Siberia, the researchers said, government policies have forced speakers of minority languages to use the national and regional languages, like Russian or Sakha. Forty languages are still spoken in Oklahoma, Texas and New Mexico, many of them originally used by Indian tribes and others introduced by Eastern tribes that were forced to resettle on reservations, mainly in Oklahoma. Several of the languages are moribund. This is not too long ago, but I still feel I should post it…I remember hearing this all the time on the radio on the way to school back AD ( Abu Dhabi). Thirty Djiboutian couples, chosen from hundreds of people who replied to an advert offering a free wedding, have been married in the capital, Djibouti.The BBC’s Abdirahman Koronto says Djibouti’s first mass wedding has been the talk of the town. An Arab businessman offered the all-costs paid nuptials as the former French colony celebrated its 30th anniversary of independence this week. His spokesman said it took two months to whittle down the applicants. He told the BBC that his boss, Dubai businessman Sheikh Ibrahim Said Ahmed Loita, had advertised on television, radio and newspapers to find the perfect candidates. They had to demonstrate they had enough money to bring up a young family. More than 600 guests attended the lavish party at a five-star hotel on the Red Sea coast. Among the guests were the president and first lady. 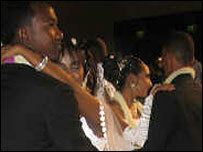 Our correspondent says the dancing went on till the early hours of Friday morning. “I am very excited, and I hope to have sons and daughters from my marriage,” Amina Omar Aden, one of the 30 brides all dressed in white gowns, said. “I am very happy, because it is the 30th anniversary of our country and we are marrying. Ibrahim Loita has helped us so much,” Ibrahim Dhaban Hufane a bridegroom from the Arte region told the BBC. Mr Loita paid for all the festivities, including the clothes, hotel party and accommodation and the dowry of $400 given to each bride and an undisclosed amount to her family. The first lady has bought all the newly-weds new furniture. 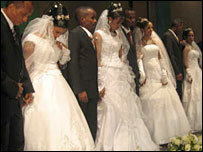 Many young couples find it difficult to marry in Djibouti because of the expense, our reporter says. Because of all the traffic I’ve been getting on this post; I’ve decided to post a video I found that shows where the wedding took place! Enjoy! Tony Blair is to become a Middle East envoy working on behalf of the US, Russia, the UN and the EU. The announcement comes just hours after he stood down as UK prime minister and shortly before it was announced he was to quit as a member of parliament. Mr Blair said a “solution” to the problems in the Middle East was possible but that this would require “huge intensity and work”. Russia opposed his appointment initially but has since agreed to it. During his final prime minister’s questions on Wednesday, Mr Blair was asked about the Israeli-Palestinian dispute. Mr Blair’s appointment comes at a time of heightened tension in the region. Earlier this month Hamas militants overran the Gaza Strip, defeating the Fatah movement led by Palestinian Authority President Mahmoud Abbas. Mr Abbas, who is supported by Western countries and Israel, now effectively controls the West Bank only. He has sacked the Hamas-led unity cabinet and declared a state of emergency. BBC Middle East editor Jeremy Bowen says failure in the Middle East is more likely than success. Israelis like Mr Blair because they believe he is on their side and Palestinians in the main do not trust him for the same reason, our correspondent adds. But senior UN officials describe Mr Blair as a star player who will bring energy to the peace process. Mr Blair, who had been UK prime minister since 1997, was replaced by Gordon Brown on Wednesday. He has proved a controversial figure in the UK and elsewhere for his decision to lead the UK into the Iraq war. But he has also been widely praised for his efforts in bringing the peace process to fruition in Northern Ireland. At prime minister’s questions, Northern Ireland First Minister Ian Paisley said: “I just want to say to the prime minister this one word: He has entered into another colossal task. What are your opinions on him taking on this high- profile position? Do you feel he can bring peace to the Middle East? 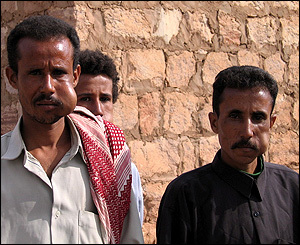 Yemeni men chew qat/khat in the main qat market in Sanaa May 9, 2007. SANAA, May 28, 2007 – Lunchtime in Sanaa. Offices begin to close, the crowds disappear from the ancient souqs, restaurants hurry their last customers out: the qat is here. The arrival of this mildly stimulant shrub by truck from the countryside heralds the end of the working day as Yemenis settle down to chew its leaves for the next four, six or even 10 hours. On any given afternoon, many men sit, drive or walk the streets with a tennis ball-sized wad of qat in one cheek, looking at first glance like they desperately need a dentist. Zayed al-Rehani, 28, swears by the stuff. Qat, or catha edulis, has become the national pastime in this poor Arab country of 19 million, but one many experts say is ravaging Yemen’s frail economy and sucking up precious water. Demand for qat is so high and Yemenis are so inclined to spend a large chunk of their paltry incomes on it that farmers are uprooting their fruits, vegetables and coffee in favor of the popular evergreen that provides year-round profit. Qat production has grown by more than 41 percent to 147,444 tones in the decade to 2006, according to official figures. That makes qat Yemen’s biggest cash crop by far; just 22,002 tones of its nearest rival, cotton, were produced in 2006. Already filling terraces across much of Yemen’s mountainous north, qat is now making inroads into the plains further south.